I have met a lot of brides in my time, and dear Elle is probably one of the most organised of them all. Little Bloom was lucky enough to be asked to make some floral collars for Elle's two fur baby pugs when her now hubby popped the question in January, skip forward a short 8 months and Elle, Bryce and their families had pulled together the most amazing day! The wedding venue for ceremony and reception was Silverton NSW a short 20 minute drive from Broken Hill. For Elle's bouquet we choose a selection of white blooms including imported peonies, ranunculi, roses and freesia, for texture and depth we added queen anne's lace, berzillia, gum and silver suede. The bridesmaids and flower girls bouquets used similar flowers to Elle's bouquet but we used sea holly and burgundy ranunculi to tie back into the colour palette of the bridal parties dresses. For Elle we created a hairpiece of white ranunculi, spray roses, sea holly, berzillia and gum. For the maids and flower girls we also wired individual pieces of sea holly and white roses for hair stylist Caitie Hibberd (Tonic Hair Spa) to place. At the venue we filled jars with gyp flowers for the tables and dessert grazing station, we also created a garland of magnolia and gum over some vintage doors. 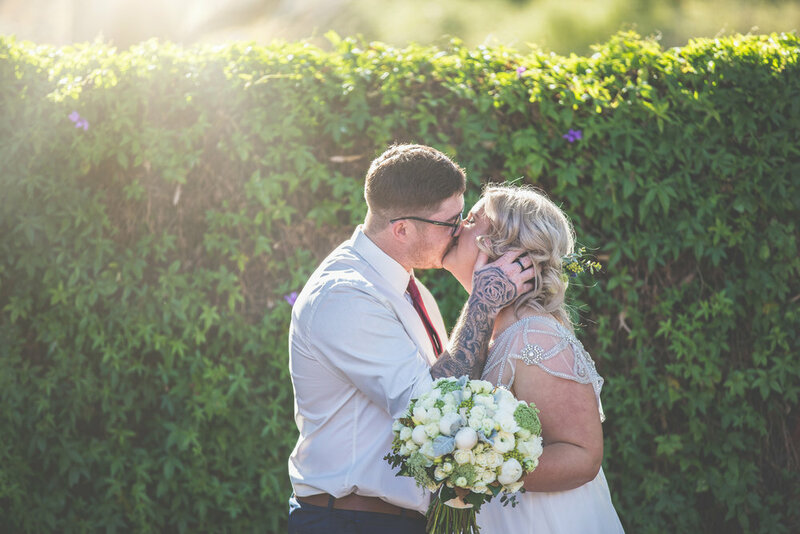 I absolutely love the contrast between the magnolia and gum, it looked so lush and came up amazing in the couples professional shots. I was also lucky enough to once again work with the amazing Sophie from Sophisticake on some small floral placements to adorn her stunning cake, she also made the insane spread of cupcakes for the dessert grazing station, YUM. Elle & Bryce - CONGRATULATIONS! and thank you so much for having me as a part of your special day, it was an absolute honour.